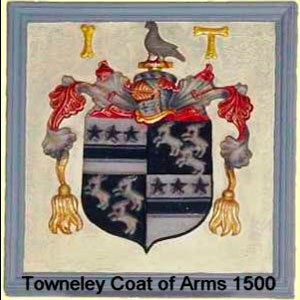 This page contains examples of Townley / Towneley coats of arms - but may need major updates after more research! Wall decoration at Towneley Hall showing arms from around 1500. The three goats (?) in two quarters seem to come from the 1480 marriage of Sir John Towneley to heiress Isabella Pilkington - who brought both the Pilkington cross and her mother’s (?) 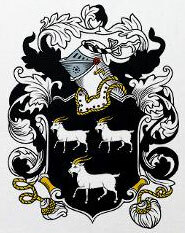 three goats as armorial designs. Her mother’s family name is not yet known. 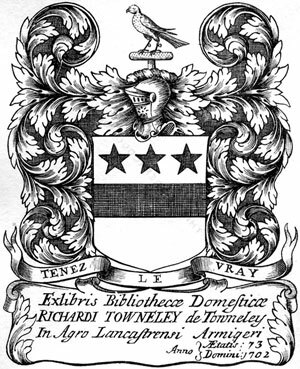 Standard Townley Coat of Arms and the one listed in most surname marketing databases. 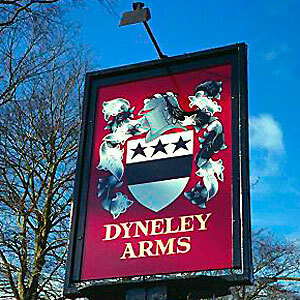 One of the incorrect Townley arms give by some surname artwork sellers. 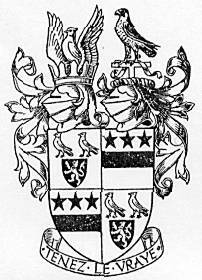 The source for this design may be the “Pilkington” quarter of the arms displayed at Towneley Hall (see above).